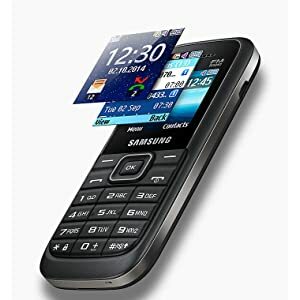 Buy Samsung Guru FM Plus (SM-B110E/D, Dark Blue) @ 17% Discount. The Guru FM Plus offers stunning design with its leather-feel rear casing, two-tone colour scheme and smooth curves, in addition to a secure and comfortable grip. 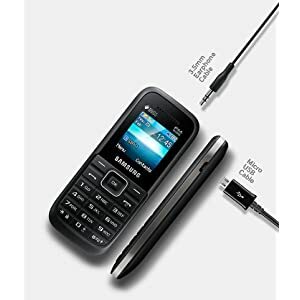 The pocket friendly feature phone with efficient performance is what defines the Samsung Guru FM Plus. It has a 208 MHz single core processor for fast operations. It is fitted with an internal memory storage of 4 MB for messages and contact. The processor makes the phone blazing fast for a feature phone. Samsung Guru FM Plus has a 1.5 inches TFT display that gives a superior quality visual display. It has a resolution of 128 x 128 pixels and a colour density of 65K to give you bright and colourful visuals. The phone has a slim bezel, 12.2 x 9.6 x 5 cm, that offers a snug fit in your palm, pocket or purse. The rubber keypad and 5 key navigation are easy to operate and ergonomic. Powered with 800 mAh battery it gives up to 10 hours of battery back. Enjoy long hours of connectivity with the Samsung Guru FM Plus. This feature phone is fitted with 3.5 mm headphone jack so you can enjoy nonstop music with its in-built FM Radio. The power charging port is micro USB which can also be used to connect your phone to your laptop or PC. Sit back and enjoy more with the Samsung Guru FM Plus. Best Cheap Deals For Samsung Computer & Laptop Accessories, Grab Cheap Samsung Guru FM Plus (SM-B110E/D, Dark Blue) Online.